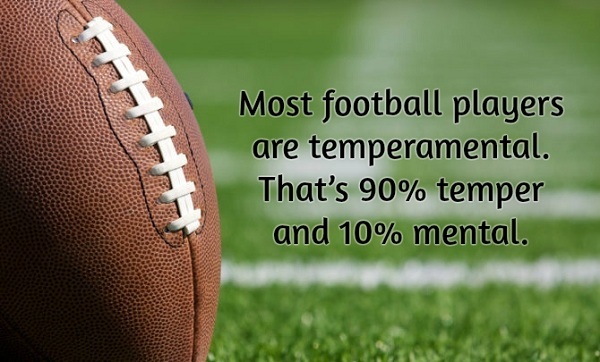 Most football players are temperamental. That’s 90 % temper and 10 % mental. 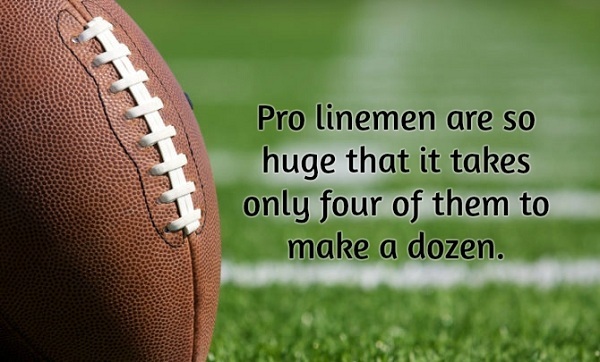 Pro linemen are so huge that it takes only four of them to make a dozen. 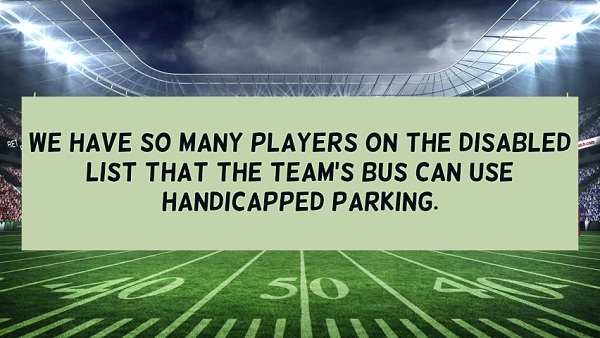 We have so many players on the disabled list that the team’s bus can use handicapped parking. 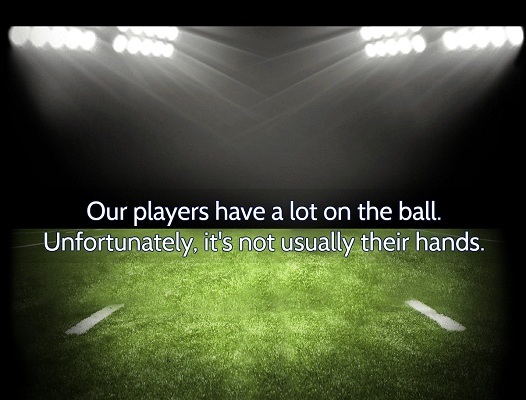 Our players have a lot on the ball. Unfortunately, it’s not usually their hands. 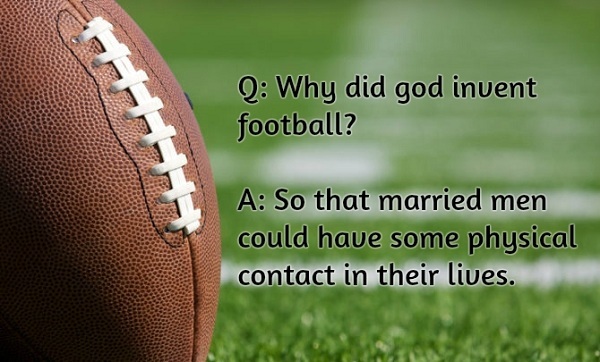 Q: Why did god invent football? A: So that married men have some physical contact in their lives. The place kicker attempted a field goal, but missed. 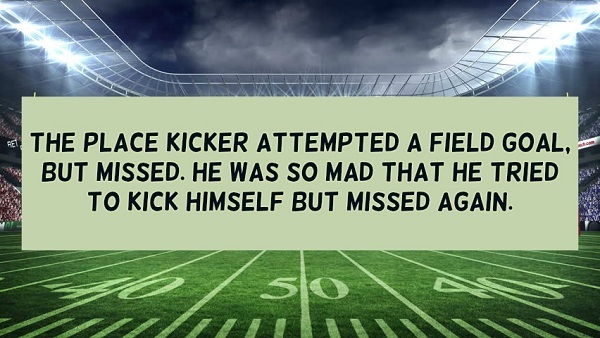 He was so mad that he tried to kick himself but missed again. 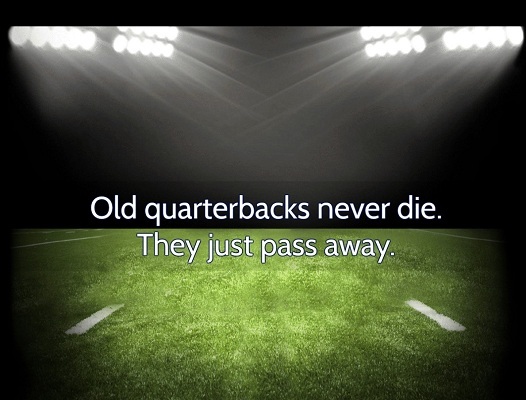 Old quarterbacks never die. They just pass away. I would have played football, but I have an intestinal problems – no guts. Honey, I know I told you that I loved you more than football, but that was during the strike. Our linebacker is so strong he can even pitch horseshoes while they’re on the horse. Two of the biggest American traditions associated with football games are tailgating and Thanksgiving. A stadium tailgate under the scorching heat or freezing cold is definitely a spectacular scene. What’s not to like with sharing football thoughts with your fellow fanatics while munching some grilled treats? 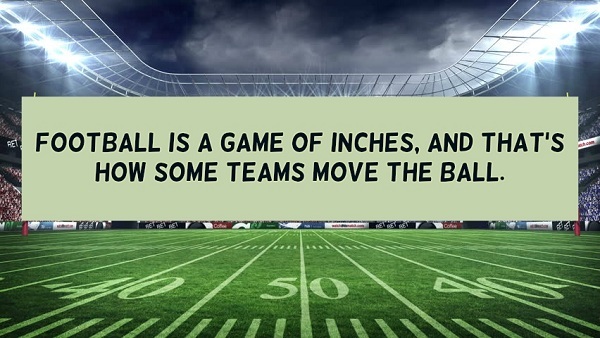 The Thanksgiving football, on the other hand, is another anticipated celebration to pump up the football craze. And before we forget, the most awaited of them all is the Super Bowl, which is dubbed as the game with no tomorrow. This pretty big event makes football bigger, brighter and better (not to mention, a fun filled gathering graced with some of the leading celebrities and artists! ).